Qinyuan is a room. "Qinyuan is a quiet place. Students of the Faculty of Computer Science and Technology live here. There is a east-west direction road called Bauhinia Road. Go along this road and you'll arrive at The West Twelfth Teaching Building." The West Twelfth Teaching Building is west of Qinyuan. "There is a statue of Lao tze in front of The West Twelfth Teaching Building. A arrow on the ground says 'Go N206'." 在创建场景时，可以用的表示方向的词有: north, south, west, east, northeast, northwest, southeast, southwest, above, below, inside, outside. Classroom N206 is a room. "Classroom N206 is a normal classroom, it can hold 100 students." Inside from The West Twelfth Teaching Building is Classroom N206. The West Twelfth Teaching Building is west of Qinyuan. East of The West Twelfth Teaching Building is nowhere. The Huazhong University of Science and Technology is a region. Qinyuan, the West Twelfth Teaching building, Classroom N206 are in a region called the Huazhong University of Science and Technology. 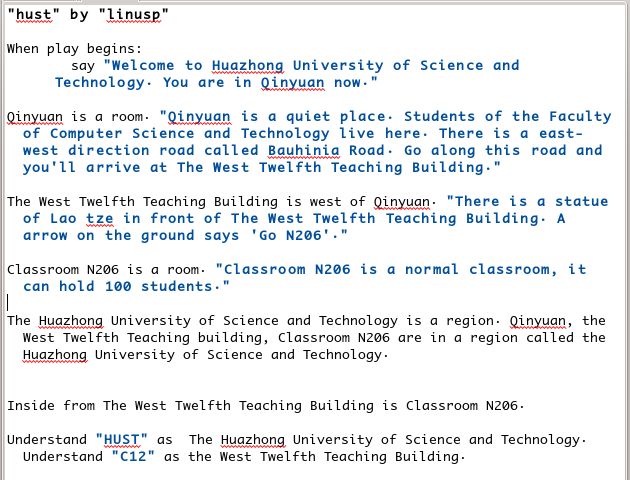 Understand "HUST" as  The Huazhong University of Science and Technology. Understand "C12" as the West Twelfth Teaching Building.